Quality Milk Management Services Ltd.
QMMS Ltd enjoyed a successful evening at the Dairy Industry's 'Cream' Awards last month, with clients Chris Norman (Herefordshire) and William Fox (Hampshire) winning the coveted RABDF Gold Cup and Young Dairy Farmer of the Year Awards respectively. 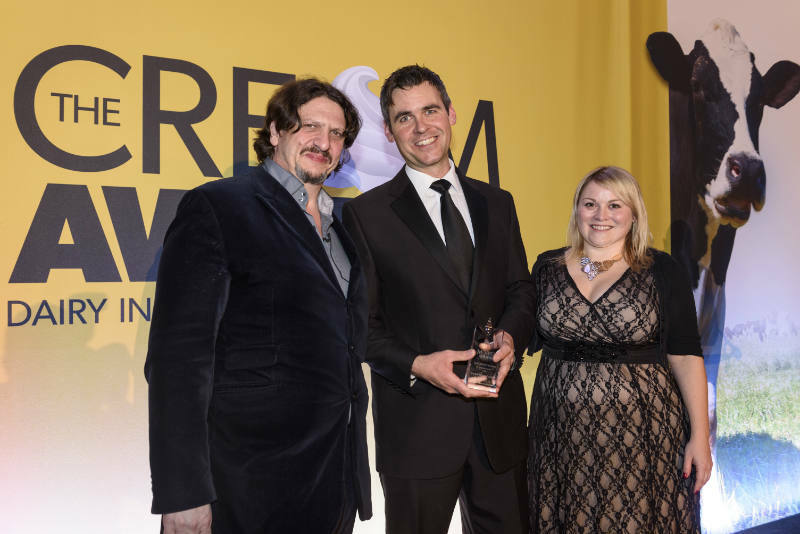 In addition, QMMS vet Dr James Breen was recognised with a special 'Judges Award' in the Dairy Vet of the Year category - pictured below receiving his award from food critic and writer Jay Rayner and Charlotte Read, account manager at Krka UK. 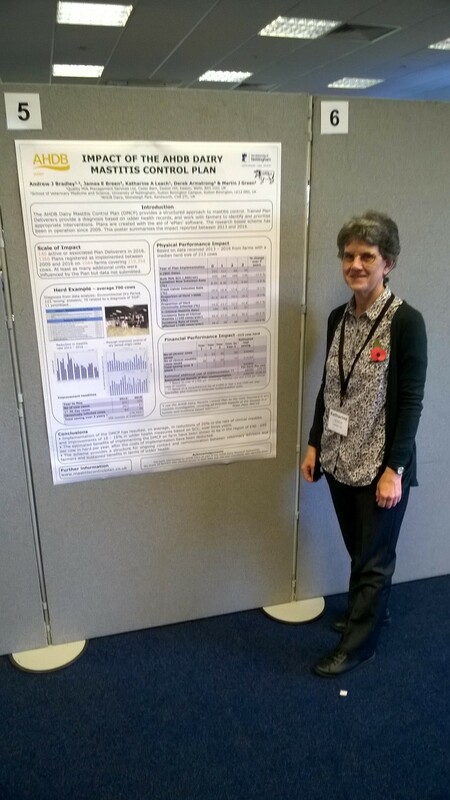 At the recent meeting of the British Mastitis Conference, Dr Katharine Leach (below) presented headline findings from the AHDB Mastitis Control Plan project. This project has been managed on behalf of AHDB by QMMS Ltd and Nottingham University, and has collated data from herds using the Plan between 2009 and 2016. From the on-farm data collected (both somatic cell count and clinical mastitis case data), herds using the AHDB Dairy Mastitis Control Plan (DMCP) achieved an average reduction of 20% for clinical mastitis rate and an average reduction of between 10-16% for new infections as measured by cell count. The estimated benefits of implementing the DMCP on farm have been shown to be in the region of £40 per cow in the herd per year, AFTER costs of implementation have been deducted. Given these findings, it is proposed that a nationwide roll out of the DMCP could result in 1,000,000 less tubes of lactating cow therapy being used each year. A copy of the poster is available to download and view here. At the recent NEC Livestock Event, QMMS Ltd. launched a new service for dairy farmers to assist with decision making at drying-off when looking to reduce and rationalise the use of antibiotic dry cow therapy, particularly in cows that are likely to be uninfected with a major pathogen at drying-off. This new QMMS service - The Dry Cow Therapy ‘Selective’ Testing Service is centred around the strategic use of cell counts and is designed to be used in conjunction with your veterinary surgeon. The service helps the cost effective identification of infected cows prior to drying off, using existing on farm records, and supplemented with additional cell count tests where necessary. To this end it is primarily aimed at herds currently not recording, recording less frequently than once monthly or aiming to reduce their costs. The principle underlying the test is that once a cow has been ‘defined’ as infected (for the purposes of drying off), further testing is not necessary. The method and thresholds used can be tailored to the individual unit. Dr James Breen was recently invited to speak on the subject of Selective Dry Cow therapy at the Total Dairy Expo held in Carlisle in March. Speaking to an audience of farmers, vets and industry representatives, he outlined some of the research in this area, including published work by Dr Andrew Bradley and the QMMS team in the UK. A summary of the latest thoughts in this area is available as a QMMS Technical Note in the Publications section of this website, or by clicking here. QMMS Ltd has recently been involved in further research into the use of Recycled Manure Solids (‘RMS’, 'Green Bedding') in dairy herds. In conjunction with Nottingham University, The Dairy Group and the Paragon Veterinary Group, a project was put forward to build on the initial work from a scoping study completed in 2013. This latest project has been funded by the Welsh Government and was commissioned by AHDB Dairy. Part of this latest research has been a survey of bedding management in dairy herds, comparing those herds using RMS with herds bedding cows on sand and herds bedding cows on sawdust. Hundreds of bedding samples were processed at the QMMS bacteriology laboratory and samples were assessed for dry matter (right), total bacterial counts, coliform counts and more. The results from a large Randomised Clinical Trial investigating the impact of a commercially available mastitis vaccine ('Startvac', HIPRA UK) for dairy herds has recently been published in the Journal of Dairy Science. The research, carried out by Dr Andrew Bradley and the team at QMMS Ltd, looked at more than 3000 cows in 7 herds based in the south-west, and measured clinical mastitis and cell count outcomes, as well as using bacteriology to identify infected cows. Whilst the vaccine did not reduce overall mastitis rate or cell count parameters, the odds of a clinical mastitis case presenting with severe signs were 40% lower in cows receiving the vaccine 'on label'. Interestingly, vaccinated cows gave significantly more milk and milk solids in the first 120 days of lactation. The paper is published 'open access' and can be viewed here. QMMS Ltd, in conjunction with the School of Veterinary Medicine & Science at Nottingham University and The Dairy Group, have recently completed a scoping study into the Potential Risks (and Benefits) of Using Recycled Manure Solids - so called 'Green Bedding' - as a bedding material for dairy cattle. The scoping study summary report discusses a series of management and husbandry items that are likely to be important for producers who are using Green Bedding to adopt and also highlights the need for further work. You can view the AHDB Scoping Study executive summary report here and read the paper presented to the British Cattle Veterinary Association here. Dr Andrew Bradley recently presented data at the British Mastitis Conference from three years of clinical and subclinical mastitis bacteriology covering more than 6000 submissions and more than 500 UK herds. He noted that the aetiology (or cause) of mastitis was very diverse for both clinical and subclinical samples, encompassing more than 100 different pathogens, predominantly environmental organisms. 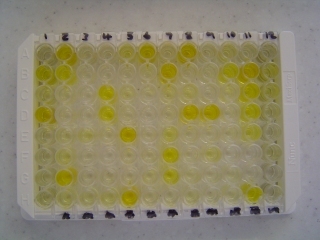 Contagious pathogens were still implicated in around 10% of submissions, particularly Staphylococcus aureus. Interestingly, penicillin resistance was identified in less than 15% of tested isolates of S. aureus, much lower than previously reported. The research summary is available here. Dr James Breen was recently invited to speak at the annual Large Herds conference in Gloucestershire on the subject of mastitis control in dairy herds, and presented a talk alongside one of our milk recording clients using their data to illustrate the power of cell count and clinical mastitis case analysis. You can follow the link to the audio page if you wish to listen to the talk here or read the slides here. QMMS recently held a one-day symposium on the challenges facing the modern dairy herd to celebrate the opening of it's new premises at Cedar Barn. The symposium consisted of five presentations on topics including automatic milk harvesting and sensing (Ian Ohnstad, The Dairy Group), ensuring dairy herd health and the role of the farm vet (Prof Martin Green, University of Nottingham) and the challenges of dairying in the 21st century from a farmer's perspective (Nick Tyler, Kingsplay Holsteins) to an audience that included local dairy farmers, industry representatives, members of the farming press, consultants and veterinary surgeons. In addition, Wopke Beukema from Delta Instruments updated the meeting on the latest in milk constituent analysis and Dr Andrew Bradley from QMMS discussed the role of antibiotics in mastitis control and the issues surrounding the concern over resistence. QMMS recently hosted the 5th annual meeting of the European Mastitis Panel, an MSD Animal Health initiative which consists of a selected, well-established group of mastitis experts who debate and discuss udder health topics across European countries and dairy farming systems. This year's topic centred around evaluating the efficiency of different management measures when preventing and controlling mastitis in dairy herds. Some of the latest research in this area was discussed , including the national DairyCo Mastitis Control Plan in the UK and some data from Holland. Several examples of single interventions that resulted in dramatic reductions in rates of new infections in several local dairy herds were cited, including rotation of dry cow paddocks, segregation of chronically high somatic cell count cows and the installation of cluster sanitisation systems. A full report will be available shortly. QMMS is pleased to announce it has recently completed the move to Easton, just 1 mile down the road. The business has re-located to a new, purpose-built facility at Easton Hill that will enable exisiting clients to continue to recieve the rapid, accurate service they expect. In addition, the new premises means room to grow and develop new services for farmers and new research opportunities for the industry. See contact details for the new address. The milk recording service is improved further with the recent acquisition of a new combiscope from Delta Instruments in the Netherlands. The new machine, which is a combined lactoscope (fat, protein, freezing point and urea) and somascope (somatic cell counting) can process 600 samples an hour and is extremely operator friendly, incorporating touch screen technology. This new addition to the laboratory ensures our commitment to rapid and robust results to existing dairy clients as our client base increases. QMMS is delighted to have acquired a Microflex series instrument from Bruker Daltronics, one of the handful in the UK that is available for veterinary diagnostic use. The microflex series instument is a Matrix Assisted Laser Desorption/Ionisation Time of Flight Mass Spectrometer (MALDI-TOF MS) - essentially an instrument designed to automatically identify proteins, oligonucleotides and biomarkers to enable the identification of bacterial pathogens. 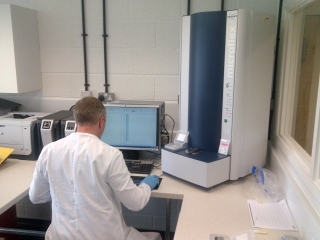 The instrument compares results to a medical database and is therefore able to identify a huge range of bacterial pathogens, making it an exciting piece of technology to work with for research and commercial purposes. 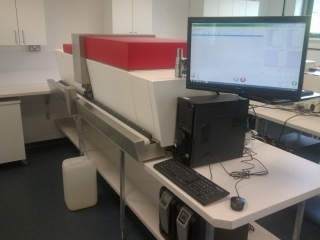 The Bruker is now routinely used alongside conventional bacteriological techniques at QMMS. QMMS now offers individual cow milk sample testing for antibodies to Mycobacterium avium paratuberculosis (MAP), the infection which causes the clinical signs of Johnes Disease in cattle. Antibody-positive cows can be clearly marked and managed away from dry and other calving cows to aid breaking the cycle of disease transmission. Johnes testing can be incorporated into your routine milk recording by using samples collected for cell count and compositional analysis and we often advise selective testing based on previous disease test results and age of the cow to offer a cost-effective risk management monitoring service. Further information and specialist veterinary advice on the purpose and pitfalls of Johnes testing is available from Andrew and James. 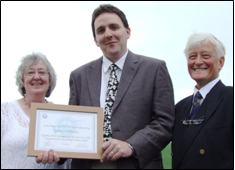 The milk recording service of Quality Milk Management Services (QMMS) has been awarded an International Committee for Animal Recording (ICAR) Certificate of Quality. It is the first ever UK milk recording body to undergo and pass an independent ICAR audit of its processes and services, using a visiting, foreign expert as auditor, according to ICAR technical adviser Frank Armitage. He says there are currently only nine holders of the certificate worldwide. Under Mr Armitage’s supervision, ICAR has recently introduced a three year cycle of accreditation for milk recording services. More than 200 dairy farmers in England, Wales and Scotland use the QMMS service, according to proprietor Dr Andrew Bradley. He says the service was founded in 2005 to offer farmers a highly flexible choice of milk recording service with more help interpreting the results than had previously been available. The level of service ranges from one-off recordings to meet a specific need, to full scale authenticated milk recording with data feeding into pedigree records. To help with interpretation of their milk recording results, clients and their vets have access to two QMMS veterinary surgeons, Dr Bradley and Dr James Breen. The new QMMS website has just been launched and as well as offering an introduction to the company and its services provides a point of access for useful forms, guidance notes and publications as well as a remote storage and data access facility for our clients. The website is best viewed in the latest version of available internet browsers. Quality Milk Manager (QMM) - QMMS's on farm software has been recently upgraded to allow the capture and basic analysis of locomotion and condition score data. In common with all data input in the QMM software, the capture of data is both quick and straight-forward and allows the user to print recording sheets for use out on farm. Basic reporting allows the user to see the proportion of the herd falling into each score category over the past 18 recordings. This new facility will allow QMMS clients selling milk to certain suppliers to fulfill the commitments of their contracts. For more information please contact us on 01749 871 171. Website and content © 2008-2017, QMMS Ltd, Easton, WELLS. Website design, hosting and maintenance by Evolution Computing.